Does winning a business award matter for your business? Back in my agency days, I spent many long hours compiling and submitting client entries to award competitions. Honestly, at the time, I thought we were doing to stroke their ego. But awards do more than boost your pride (not that there’s anything wrong with that). Winning an award can boost your business’ reputation and bottomline, when you know how to leverage it. 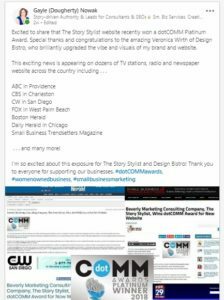 Many organizations provide winners with a press release template to announce that they’ve won an award so be sure to request one or write your own and send it out to your local business press. Want me to send it out to dozens of online TV, radio and print news sites across the country? Book a free consult with me and I’ll walk you through the details. You can announce that you’ve won an award on all your social networks OR you can get two for one by announcing your media coverage of winning the award. Feel free to swipe my LinkedIn post for your award announcement. 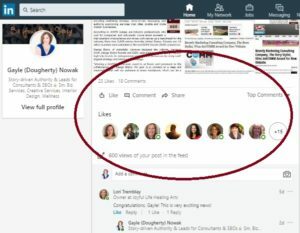 By the way, this post got far more engagement on LinkedIn than on my Facebook page, so if your audience is on LinkedIn, be sure to post there. When sharing your award news with your email subscribers and clients, couple it with content your audience sink its teeth into, like this post on how to leverage your award, or the story behind the award and how you won. You can easily get at least two blog posts out of winning an award. My post here simply announces the award, while the post you’re reading dives deeper into how you can use your award to boost your authority. You may be able to get several posts that share insights, stories and content around your award. Adding award and media logos to your website signals instant credibility to visitors who may not know anything about you. Ask your web designer to place award logos in your footer so that they appear on every page of your website. Ask your graphic designer to add the logo to other marketing assets (see #6). Add the phrase “award-winning” to your bio, about page, business cards, social profiles, direct mail, marketing collateral, signs . . . in other words, any written materials you have to promote your business. You’re emailing people all day, everyday. 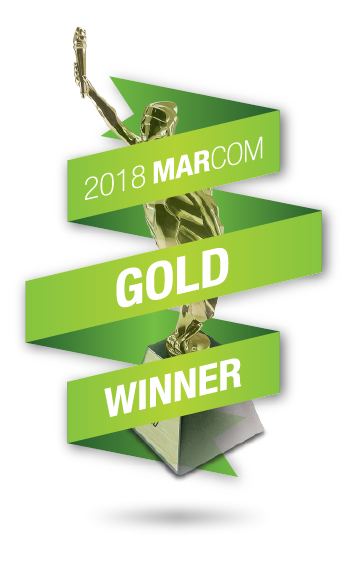 Take advantage of that opportunity to communicate your business’ award-winning status by adding a line under your email signature about a recent award you’ve won. Winning an award takes effort beyond the time, energy and money you put into your award submission. You wouldn’t win if you didn’t earn it so why not reap the rewards of all your hard work? That’s sound business strategy! Oh, bonus tip . . . share your recent business award in the comments below! Love it, Gayle! I’m with you on how important it is to shine a light on special awards and accomplishments and you share some excellent ways to get it out into the world. Thanks for sharing your tips and strategy! So good to hear from you! I bet you could do a companion post on how business owners can weave awards into their content strategy :).